Big transitions happening at J. Murrey Atkins Library this summer, with the departure of my current boss Stanley Wilder for his new position as Dean of Libraries at LSU (both of my parents went to LSU, so Geaux Tigers!). When he shared the content of the talk he gave when interviewing at LSU, I encouraged him to let me host it here. And he agreed! So, here is the (slightly edited) talk Stanley gave, laying out his vision for libraries. What I appreciate about Stanley’s take on the Future of Libraries is that it’s not about specific solutions, but about relationships and processes. Here are some things I hear: Everything I need to know is on Google. I’m a faculty member and I don’t use the library. I’m a senior in college and I’ve never been in the library. I’m a senior in college and still use my hometown public library. Hasn’t the Internet made libraries obsolete? I don’t need a library. I don’t read books. Information wants to be free. Librarians are scary people and I don’t trust book stacks! Every one of these comments is easily and demonstrably wrong, and at the same time, each one is a gift of the first order. Each one is the gift of attention, an invitation for us to explain who we are and why we’re here. We librarians ask for nothing more. Oh, we get where these questions come from: In an age of dizzying change in the nature of academic work, and the shifting shape of the discourse that drives it forward, where should the library go from here? As I see it, the library has two paths forward, and I submit this vision as my response to the prompt you’ve given me. The first path for the research library is its traditional role. A crucial aspect of the nature of learning and research is timeless, absolutely so. In this sense, if you want to know what research library will do in the future, well the answer is that it will do what it has always done. If you’ll bear with me, I’ve drawn a picture of what I mean. This is the scholarly record. It is the record of what is known or imagined about the world. Teaching and research consists of assimilatingthe scholarly record as it pertains to the disciplines we study, in such a way as to enable us to synthesize something new. In the case of faculty, this synthesis is the creation of new knowledge or new art that adds to the scholarly record, where the cycle starts over. This picture applies to students as well, wherein the syntheses they produce often take the form of apprenticeships for the work their faculty do. Assimilation, synthesis, reading, writing. Here is teaching, learning, and research, as an endless, virtuous cycle around the scholarly record. I say YES to that: the core function of a research library is now and always will be to build the collections that drive this cycle. Of course it’s not enough to simply build collections, the library also has to facilitate how people interact, at both ends. For example, teaching generations of new students how to work with the literatures of their chosen disciplines. But really, all library services can be characterized in this way. They cluster at these transition points, here and here. And with that, I’m going to stop myself because I promise you, I could go much further with this silly drawing. My point is this: the idea of the library is so embedded in the fundamental nature of learning and research that it makes no sense to ask whether you need one. The real question before us is whether you need a great library. That, then, is my first path. Everything about it relates to the “what” of academic work, what it is fundamentally, what it intends to do in the world. And yet, at this very same changeless moment, we are now in a period of full-scale revolution in how academic work gets done. Students and faculty alike are using new tools, in new ways, to produce scholarship in forms that were unimaginable just ten years ago. I used the word “dizzying” a while ago, and I meant it: in this environment, uncertainty abounds. But here’s one thing I am sure of, and if you retain nothing else from this presentation, please let it be this: this new environment is going to allow smart research libraries to perform that ancient role in ways that produce spectacular new value. This is the library’s second path: embracing, inventing the future so as to do better what we have always done. Like what, for example. There are so many opportunities that really, our problem is choosing from among them. I’m going to just call out some, a simple list of examples that… illustrate my point, obviously, but I’ve also taken care to choose examples that I have experience with helping produce. Every item on this list is now or should be a new part of a research library portfolio. What’s more, each one relates directly to issues that faculty and institutions are wrestling with right now. In many cases, they are wrestling, but not knowing that what their library has to offer. There’s nothing dismissive or condescending about it, they just don’t know. Ladies and Gentlemen: the biggest threat to research libraries is low expectations. Sometimes they come in thoughtlessly dismissive ways, “Aren’t libraries obsolete?” But just as often, low expectations feel warm and fuzzy, filled with nostalgia for a world that no longer exists. To my ears, both are equally toxic. So no, our communities can’t be expected to just know enough, say, about the dangerous instability in the scholarly communication marketplace to understand the importance of open access, or any of the other ways we librarians can make things better. No, we have to tellthem, and we have to show them. I think constantly about how the library positions itself vis-à-vis students and faculty. Imagine a continuum. 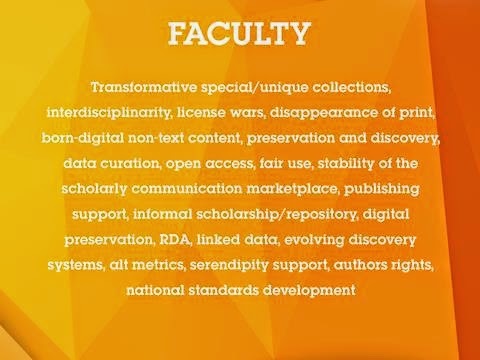 At one end is library as simple service provider, and on the other end is library as full partner, contributing in a substantive fashion to any campus conversation relating to the institution’s core academic mission. Yes services are crucially important. But make no mistake: real sustainable relevance on campus requires assertiveness, it requires visibility.Everything on this list is an invitation to do just that. I have one more thing that I must say about the list. 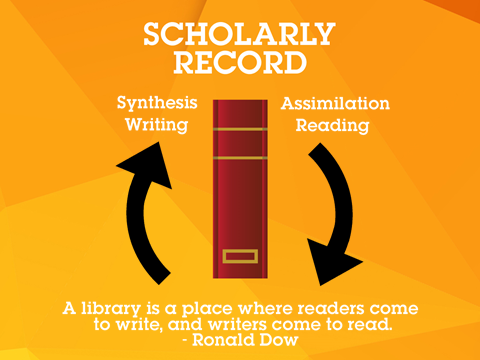 The work required for each is grounded, in one way or another, in traditional research library values and expertise. At the same time, every one of them is situated in an entirely new context. I feel a real sense of urgency on this point: this list is turf, and it is ours for the taking. But doing so means that as a profession, as a library, we must recognize that producing the transformational outcomes that are possible here also requires newskills that we must either learn for ourselves, or hire into our organizations. This is not a phase, it’s the new normal. Let’s talk about students. The library’s student role is large and diverse, as it always has been, but here again we find watershed developments all around us, and once again, the new opportunities that come with. Half of a research library’s student function is pedagogy. Instruction. The thing we do here is to increase the sophistication of students in interacting with the literatures of their chosen disciplines. 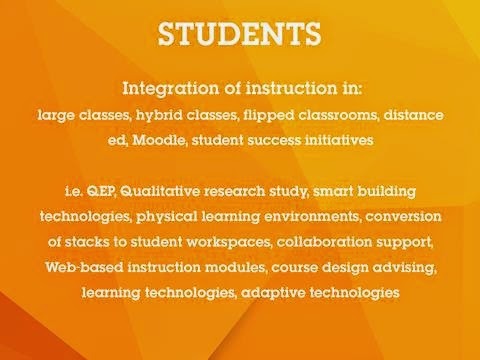 Fine, but as you see from the list on the screen, that pedagogy isn’t just situated in terms of discipline, it’s also situated in a broad range of learning environments, which makes it subject to the same seismic change that is shaking teaching throughout higher education. A quick story to illustrate: Recently, the head of our instruction programming discovered that faculty are very receptive to hearing about ways they can pare back on research paper assignments, in cases where doing so allows them to focus attention on the topic-choosing, question-framing, literature searching, basic-synthesis-forming skills. Library instruction can help with all of that, and this librarian and her staff have created web-based, interactive, and discipline-specific instruction modules that support that use case. And now Stephanie Otis has a fine trade in advising faculty with their course design. That’s a small but significant example of what I mean by proper positioning of the library on campus. Stephanie puts us exactly where we want to be. The second half of our student function is building-related, the spaces we provide for student academic work. I have a missionary’s zeal as to the following idea: research libraries can be instrumental in building the culture of study on campus. There is a powerful synergy here that only we can offer: the co-location of librarians with collections, and technologies, placed in appropriate spaces,with appropriate furnishings, long hours, and reliable security. No one else can do that! I like to say that a good research library should be like a zoo. As you pass through it,you will see students in the very act of learning:chemistry equations here, Chinese vocabulary there, marketing, biology and all the rest, live and happening right before your eyes. You can even point at them, you can throw popcorn, they don’t mind, but the thing you’d be pointing at is the thing we all work every day to produce, it’s our professional reason for being. If you don’t walk through that zoo and feel energized, I suggest you may want to find another line of work. I would have all students socialized in this way, to where those zoos are just normal: long hours of intense group or individual study? I’ve got a bit of show and tell to do for you now, a bit of bragging, maybe, but my intention is to give you a feel for this vision in action. My story begins this time last year, at UNC Charlotte. Our library was presented with an exceedingly generous bit of one-time money in a more or less blank check fashion. At that moment in time, a number of very prestigious University Press book publishers suddenly made their current lists available, as a package, and in digital format. No limits on simultaneous users, no digital rights restrictions, and good preservation characteristics. We jumped, bought everything of this sort that we could. We added 75,000 monograph titles last year, average price per ebook volume: about $10. By June, everything’s in place, the community has full access to these books. Now, our staff looked at those titles and recognized that there were many among them that were going to be assigned reading for students in the fall. If we could get the word out to faculty and students, we could save students lots of money. With this insight, our staff flew into action, and just in time for fall semester, produced this web page, complete with links to the ebooks. They also prepared a social media campaign to alert students and faculty. Here’s what we learned: if you use Twitter and Facebook to spread the word about free textbooks? Get out! In a PR sense, nothing we’ve ever done has been so successful, so fast. So fall semester follows, and the use data on these new ebook packages starts to roll in. Friends, I’m here to say: the scholarly monograph is NOT dead, its use in ebook format is fantastic. Quick example: we have a huge investment in Springer journals and ebooks: our book chapter downloads, from day 1, run slightly ahead of Springer article downloads. Sure, this is a bit of apples and oranges, but on the face of it, it flies against every instinct a research librarian could ever have. Kinda mind blowing. Spring semester comes, and this time we have had more time, we’re better prepared, and come up with this web page, and associated PR. The results have been stunning, faculty and students alike galvanizedaround our initiative, we know of a history professor teaching graduate classes for which the students have heavy reading lists, but no books they must buy. Now we’re up to 4 weeks ago, our staff unveiled their own invention, a database that faculty can use to “shop” for ebooks appropriate for assigning for classes. The database consists of 140,000 titles, every ebook we own, plus every ebook we can get easily get from one of about a dozen University Presses. As you can see, if you’re a faculty member, see something you want to use for class, we buy it immediately if we don’t already own it. Now class, let’s review: this anecdote gives us a shiny example of both paths: path number 1: exactly what is new about a research library buying books to support curriculum and research? And then once we’ve got them, what is new about making those books available for class use? It’s reserves! OK, there’s our ancient function, but we’ve also got path number 2: everything about howwe did all this is new, not just new, it provides brilliant new value that wasn’t possible before. One last point about that anecdote: I ask you: did the University ask the library to invent a program like this so as to lower the cost of going to college? Because that’s exactly what’s at stake here. NO! They couldn’t have, they couldn’t have known to ask! I talked about low expectations awhile back: sometimes low expectations flow from folks just not knowing what we’re capable of. But I can promise you, people will listen, and they’ll certainly notice. At this point our staff are fielding queries from all around the country, folks wanting the code, wanting to see how we did every aspect of this. Meanwhile, back on campus, our entire community looks at the library in a different, and better way. Here again, a well positioned library. I should pause here to give full credit: the vision behind this anecdote owes entirely to Chuck Hamaker. Once Chuck had this idea, he had inspired help from a large number of staff across units. Oh, and here’s another point: my role in this project? I supported it. Nothing more than that! Seeing your library also means seeing its staff. Committed professionals every single one, they possess a spectacular range of expertise. And yet, like the books on the shelves, these people in front of us also evoke the generations of staff that preceded them. I’d like to tell you a story from my early days at LSU. So early that I was still scrambling to remember the names of my new colleagues. One day a meeting. We were discussing the consequences of a decision made by a staff member, and, wishing to contribute, I suggested that I could meet with her to negotiate. Which prompted whoops of laughter: this person had retired sometime in the 1960s, and had long since passed. What an epiphany in that moment, though: such a testament to the enduring quality of our work. We can only conclude that we did not build this thing. It was handed to us as a trust, a sacred trust, that through our brains and hard work, we ensure its renewal, and then hand it over in our turn. Stronger than before. This entry was posted in Uncategorized and tagged #clubatkins, #uncc #lsu, engagement, libraries, the future on June 2, 2014 by dlanclos.